What You Never Knew about the Lincoln Assassination! Friend of J. Wilkes Booth? Rebel deserter? Inspiration for a great novel written by his military judge, General Lew Wallace? Known as Lewis Paine, he was hanged for the unspeakable crime of being the paid companion of Lincoln's killer! With shocking accuracy, a twisted version of Romeo and Juliet unravels on these pages. Patron of young rebel soldiers, the notorious matinee idol enlists the 18-year old fearless Confederate in a conspiracy against President Abraham Lincoln. Cadets met Dr.Russo and Jan last March at the Solar Guard Reunion in Williamsburg. We enjoyed meeting Dr. Russo and looked forward to this collaboration. Jan and Dr. Russo have known each other and edited each other's works for many years. For the first time, they´ve collaborated on a mythography. Dr. Russo, a professor at Curry College in Massachusetts, has taught writing and written film reviews for over twenty-five years. Jan created the great looking wrap around cover for the book. THE PAID COMPAINION can be ordered online from the publisher - Xlibris. In DOOMSDAY HORIZON the Starmen race to discern fantasy from reality, and what can be changed from what cannot. The only weapons that can help them are wisdom and courage, and there is no room for the slightest mistake. action-packed drama that is filled with plot twists and major surprises. The book, which is 160 pages long and has nearly 55,000 words, is a worthy successor to the action-packed fifth Starman book, THE LOST RACE OF MARS. A full synopsis and excerpt from the book can be found on the new Starman Series website. Check out the new look for the website, good job Starman Team. NOTE: The book is no longer available through the Starman Series group. Starting with DOOMSDAY HORIZON you may order it directly from the publisher - 1stBooks. This is a great step forward for the series. It will allow the Starman Team to concentrate on writing and creating the Starman Universe. Good deal. You may also order online from Amazon and Barnes and Noble but it will be cheaper if you order it through 1stBooks. Since the book has just been released it will be available via bookstores such as Barnes and Noble and other book outlets in a few weeks. The cost in the stores may be a few dollars more to cover their overhead. If you can't wait, you may order an E-Text Edition from 1stBooks for $3.95. For those who are detail junkies and like to know the facts behind the stories, the Starman Team have provided comprehensive Appendices on the Starman website. The first two of five appendices are available on the site now in PDF, RTF or Word 2000 format. They are informative and recommended for new fans who want to "catch up" on the story line or for a quick review for cadets who are re reading the series. over the past month I have released as a free e-text the first two volumes of the Starman Appendix. Each volume (which is well over 200 pages long) gives a behind-the scenes look at how the first five Starman books were written by revealing the letters we exchanged while writing these books. There's also a lot of footnotes to explain what was going on and reveal a few interesting pieces of information you might not have known before." Thanks to the Starman team for bringing the series books back to life for our reading pleasure. Spaceman's Luck Jon and I hope to see you, Mike and if David can make it from the West Coast at the Solar Guard Reunion next March in Williamsburg. New Video/DVD releases from Swapsale. 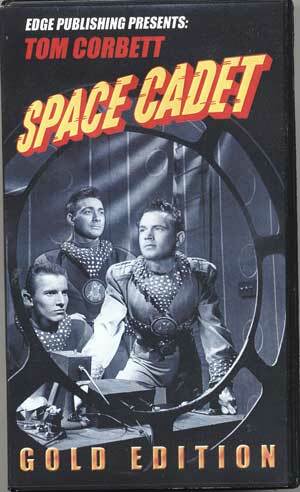 The episodes on this DVD were made directly from the original kinescopes (transferred to DV Cam to DVD) and are the 4 half hour Tom Corbett Space Cadet shows from the first Swapsale Gold Edition. 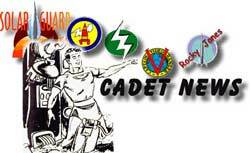 See earlier Cadet News article for story outline of the 4 shows. ADVISORY FROM SWAPSALE: While these DVD's will play in most machines and virtually all computer DVD ROM drives, a small percentage of older machines might not be able to read them. In such a case we will swap the DVD for the VHS version of this video. The video tape comes with a full color collectors box that has been autographed by both Frankie Thomas and Jan Merlin. Four complete half hour shows : The Runaway Rocket, Alcar, The Martian Revolt, Assignment Mercury plus Jan and Frankie's autograph. Jan Merlin appears in the first three episodes; the fourth has Jack Grimes playing Thistle, Roger Manning's replacement for the Polaris crew. The opening shows are followed by three non-consecutive episodes from the second storyline of the show, The Runaway Asteroid. One of these episodes has been missing since the original broadcast in 1950. There are some nice camera shots of the cadets working "upside down" in space and even a ride on a space torpedo by Astro to blow up the Asteroid. 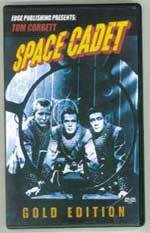 The last 4 episodes (three of which are consecutive) send the Space Cadets to their first trip to another solar system, Alpha Centuri. The cadets meet the MONSTERS OF THE PAST in a prehistoric landscape complete with "giant lizards". There are space walks and nice shots of the tail fins of the Polaris. Some of the commercials include Tom's brother visiting the Academy and having breakfast with Commander Arkwright. None of these last four episodes have been seen since their original broadcast in 1951. Unfortunetly these are the last Kinny's from the estate of Joseph Greene. The Academy wants to thank Paul Greene, Joseph Greene son, and Bruce David for making these shows available to the many TC fans who are still looking for the "lost" shows. Jean-Noel's "The Search for the Ralston Rocket." 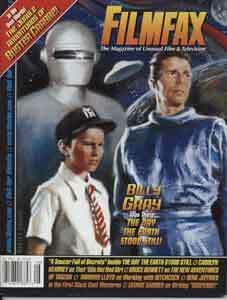 The October issue of Filmfax will include an excerpt from the Space Patrol book: "The Search for the Ralston Rocket." This chapter describes the Name the Planet Contest, contains an exclusive interview with Ricky Walker (the kid who won the contest) and ad man Ralph Hartnagel (now 95 years old), who conceived the Ralston Rockets. It tracks the two Rockets, reveals the fate of one and presents evidence for the possible whereabouts of the "missing" Rocket. 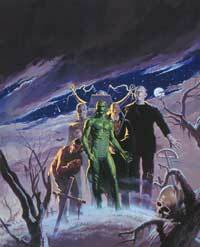 "It's a big, anniversary issue, and it will also include an examination of the deleted scenes from Forbidden Planet. It's a double-sized issue (150 pages) and will be on the stands through mid-January or so. 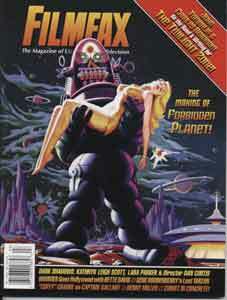 (Actually, beginning with this issue, all issues of Filmfax will be 150 pages.)" 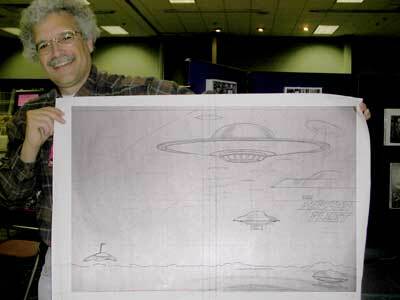 The saucer articles are from the upcoming Saucer Book by Jack. As usual, Cadet Jack has done an excellent job on his research and behind the scenes facts. These three issues contain articles and information that will interest all cadets. Check Filmfax's site for back orders of Filmfax and Outre. Bob's website has a new address http://bobburns.mycottage.com and new email addresses, check the CONTACT page for a complete listing. The proofs for the new book (Monster Kid Memories) look pretty darn neat. Over 222 pages and 304 photos. Of course, Tom Weaver has to be praised--once again, Tom Weaver has made me look articulate! Bob Madison's publishing the book and I have to say that it's been a real pleasure working with him. Marty Baumann was the art director and layout person. (He has the site called THE B MONSTER NEWSLETTER.) "Monster Kid Memories" is a tribute to all of the wonderful actors, special effects, and stunt folks that I've had the pleasure of knowing. Unfortunately, they're all gone now but I still want people to know how wonderful they all were. A few weeks ago I did an on camera interview for the new 9 DVD set of all of the ALIEN films. I've never seen so much new stuff that they found on all four of the films!. It's time for the annual Monster Bash in PA. It's such a great show. They have a great guest list and this year promises to be another fun filled event. I'll be there with Tom Weaver and we'll have the new book--autographs too! Read more about Monster Bash 2003. Also, the 2002 Time Machine is on display in the Warner Brothers Museum if you take the Warner Brothers studio tour. For more information visit Bob's site. The Smithsonian Institution Traveling Exhibition is now in Virginia, West Virginia, Ohio, Nebraska and Arizona (see links below). 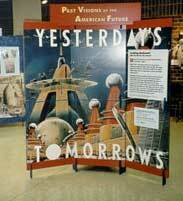 Yesterday's Tomorrow's is a traveling exhibition that explores the history of the future--our expectations and beliefs about things to come. 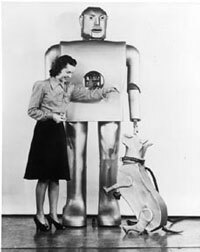 From ray guns to robots, to nuclear powered cars, to the Atom-Bomb house, to predictions and inventions that went awry, "Yesterday's Tomorrow's" helps us understand the values and hopes Americans hold and have held about the years to come. The exhibit is primarily an educational tool for schools but contains 1950's Space Opera collectibles and a link to fellow cadet and toy ray gun collector Gene Metcalf's Toy Ray Gun web site. The exhibit began its 5-year tour across the County in March 2001 and will conclude in 2006 after traveling to approximately 150 small towns in 25 states. The interesting part of the tour is the input from the local community. Each community that sponsors the exhibit will add local interest, making each event a little different. The exhibit we plan to visit in Colonial Beach Virginia has enlisted astronauts for the opening reception and local school districts have involved students in the project. The exhibit promises to be a good history lesson and maybe a chance for another generation to see some of the icons and dreams we had as children of the 1950's. A companion book to the exhibit has a picture of a Tom Corbett uniform and several other collectibles from the era, so checkout your local exhibit and see if your display has any interesting Space Opera collectibles. The colors are incredible, the gold nebula against a graduated purple star field. The ground is reddish brown. One thing you can't see at all in these photos is the texture of the background nebulae and stars (you can barely see that there are any stars!). 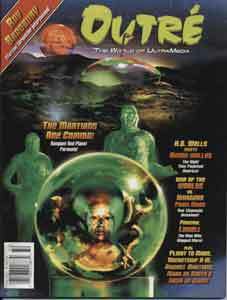 In the layout, the book title ("The Saucer Fleet") will go in the dark area under Klaatu's ship, and partially in the green beam from the Metaluna ship. The author names will go on the ground next to the Jupiter II in the dark shadow being cast by the C57-D. The spine of the book is right down the center, so the front cover will fold on the left side of the C57-D's upper dome. 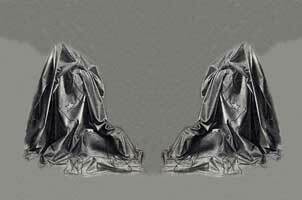 Liner notes will go in the gold area above the Martian War Machine on the back cover. Stay tuned for updates on the Saucer Fleet that never flew. 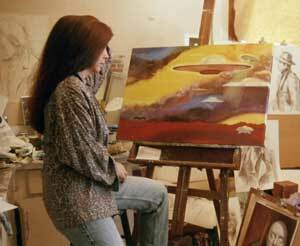 June 6, 2003 - Cover painting completed - Click on saucer cover for larger view. I was doing research on the Internet and ran across your site. This slide will answer your question! So I'm forwarding you my "slide of the week." Luer was a local meat packing house that started in downtown Los Angeles in 1885. This flatbed bound rocket ship was to them what the weenie mobile was to Oscar Meyer. 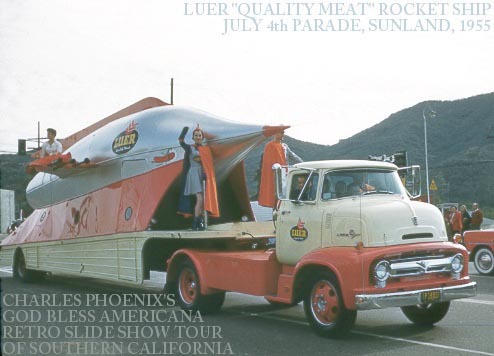 It made countless appearances in local parades, super market grand openings and other civic events promoting their "quality meat" products. Do you have more info? Or know anyone who does? The rocket has been ID'd as the Prescott rocket and later as the Luer Meat Rocket on the Solar Guard site. Information and pictures from Herb Deeks and Jerry Cook have helped pin down the current location of the rocket. Last summer, the rocket was sold to an antique car collector in Arizona with hopes of restoration. Jean-Noel Bassior has finished her book on Space Patrol (due to be published in early 2004) which includes a chapter devoted to the Ralston Traveling Rockets and the Luer-Prescott rocket. The chapter will provide some interesting answers to questions about the history of the traveling rockets of the 1950's. Several cadets have suggested that the Luer and Blakely Rockets are traveling Ralston Rockets "recycled" under a different name. The discussion continues. Charles has put together a slide show that features a historical kaleidoscope of mid-century California Culture. He created this "trip" back in time by mixing and matching original found 35mm slides taken in the 40s, 50s and 60s in color! The above slide was one found for the program. For more information about the slide show, check out his website at http://www.godblessamericana.com. NEW TOM CORBETT VIDEO RELEASE from Edge Publishing. Bruce David has produced an excellent video of rarely seen TC shows. The transfer from the Kinescopes to videotape is clear and sharp. In fact you can read the letters on the spaceships at the Space Academy. Remember what we thought were portholes on the ships at the Academy were in reality numbers. Great job Bruce. The total package, including the graphics for the video box, is top notched. To learn how these particular shows were found and placed into circulation, see the Rest Of the Story after the Show summaries. The search for a farmer who has radioactive contaminated grapes leads the Polaris crew on a wild chase across the Solar System. See NBC Network TV listings # 10. 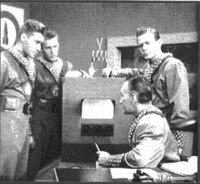 2- TRIAL IN SPACE - 7/21/1951 - The plot line is very similar to the radio show TRIAL IN SPACE. Astro contracts a Fever that may kick him out of the Unit. Some great Space suit shots that really show the open faceplate in the helmets. Some very interesting space walks are used in this episode, including some miniatures. This is a combination of an earlier set of 15-minute shows rebroadcasted as NBC SUMMER RE-RUNS. 3- THE STOWAWAY - 5/28/1955 - Nancy Masters, the grand daughter of the Defense Minister of the Solar Guard, cause problems for the Polaris crew. Nancy is played by Adele Newton a Patty McCormack look alike, complete to a girls Space Academy uniform. See NBC Network TV listings # 24. 4- COMET OF DANGER - 6/18/1955 -A photographer traveling with the Polaris crew is writing an article about the Academy's Cadet Corp. The unit gets off on the wrong foot but by the end of the show, the unit has redeemed themselves. To bad the article wasn't published sooner because this was the next to last broadcast of the Tom Corbett Space Cadet program. The final show was broadcast on June 25, 1955, a sad day for all cadets. See NBC Network TV listings # 27. One of the topics discussed at the Solar Guard Reunion this past March was the loss of valuable resources to libraries and museums who have memorabilia, including Kinescopes of the shows, donated to them. The items are usually catalogued and stored away never to see the light of day again. We owe Bruce David a thank you for his investment of capital and time in restoring these shows and placing them into circulation again. We also owe a Big thank you to the Joseph Greene family for their cooperation and support in providing the kinescopes to Bruce. Paul Greene, son of Joseph Greene, has been in contact with the Solar Guard Academy for a number of years, providing information about his father's contribution to TC from his family files ( see Joseph Greene's web page ) . Before the Christmas Holidays Paul asked for recommendations on what to do with some of the Tom Corbett Kinescopes his family had inherited from his father's estate. He was getting the run around from a museum who wanted the shows, but wasn't real interested in displaying them. My first thought was to get them into circulation and Bruce David's Edge Publishing was the perfect solution. The result is the Tom Corbett Gold Edition 1. Some of the pictures used for the video cover came from the Joseph Greene collection, another thank you to Paul and his family for sharing their memories with fans. Our thanks to Paul and his family for making these Kinescopes available to Bruce who has placed them back into circulation. After the Kinescopes are transferred, Bruce will send them back to the family for donation to the museum. A good solution for everyone. There are a few more shows that need to be restored and transferred to masters that, depending on sales, will occur in the near future. I would urge all cadets to support Bruce and buy your copy of the TC Gold Edition from Swapsale and not make copies for fellow cadets. This will help Bruce recover some of the cost from the transfer of shows to masters and provide funds for the restoration of the remaining shows. A solar medal for Bruce. Jean-Noel's SPACE PATROL book is at the publishers!!!! 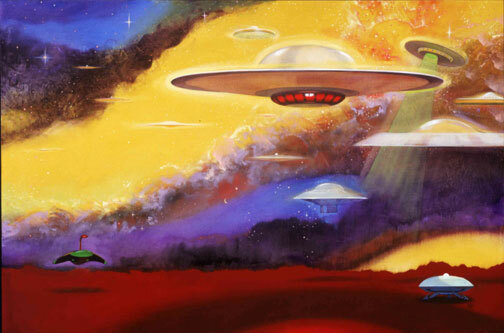 Jean-Noel brought the final SPACE PATROL manuscript to the Solar Guard Reunion in March and allowed a few lucky cadets to see the finished product. Our thanks to Jean-Noel for the research and long hours she has dedicated to writing the history of the SPACE PATROL show. 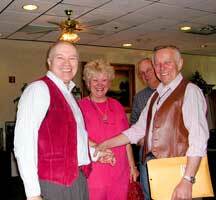 Maybe we can all gather again next March in Williamsburg for another Solar Guard reunion and a book signing. 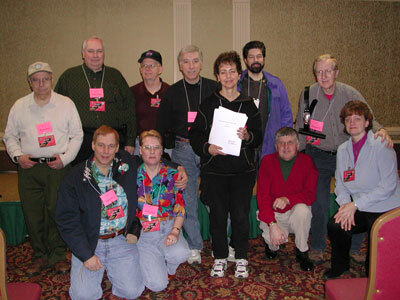 Front Row: Mike and Kim Elmo, Jean-Noel Bassior with script, Clyde Lyman,Dale and Mary Ames. In mid-March, I delivered the nearly completed Space Patrol manuscript to my publisher, McFarland, in North Carolina. While nothing is definite at this point, we discussed a 7 x 10 format with up to 125 photos and a full-color cover. (The manuscript runs over 300 pages.) I was hoping to get on the Fall list (which I didn't), but learned that even had I made it, the book would not have been released until November or December. The good news is that I'll be one of the first in line for the Spring list - and that means the book could be released as early as January or February. This was great news - it's only a couple of months later than had I made the Fall list. I spent a day meeting with the McFarland staff and was really impressed. This is not the old McFarland that used to put out books with dusky library bindings. They've improved their look and now do beautiful full-color covers. The staff is enthusiastic and creative. I get the feeling that they really care about the books they do. I'm so grateful for everyone's continuous help and support. Your recollections have contributed enormous significance and energy to this project. I have until June to do some rewriting, gather and caption photos and tie up loose ends. I'll keep you posted about the release date.